Bread is also off the menu once we get home. 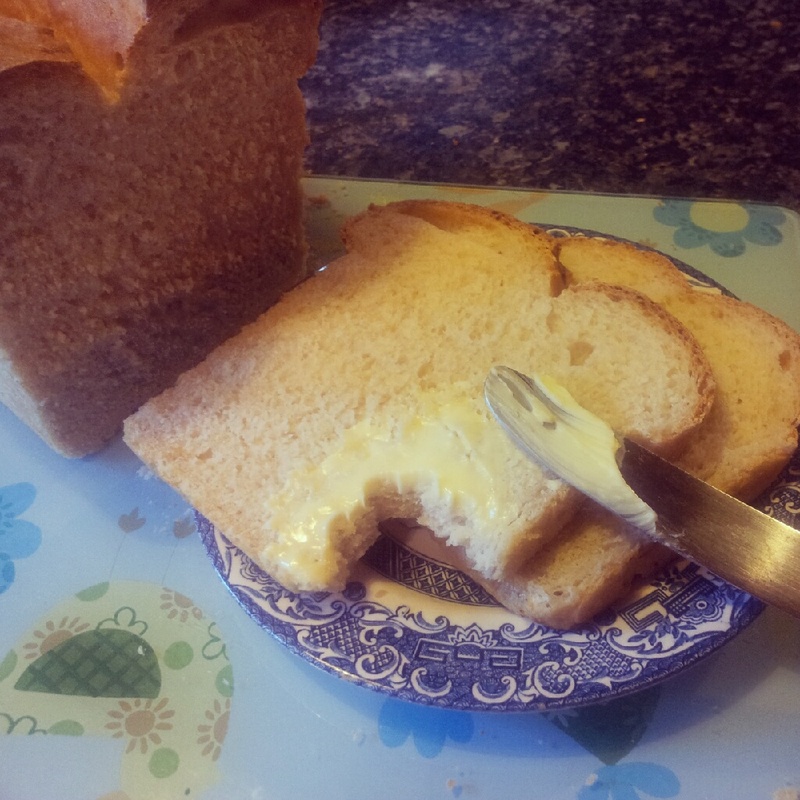 I'm supposed to be following this diet so Miss A will have to forgo homemade bread as it's the one thing I can't resist. Cake, yep I can let that go. Fresh bread, no way. 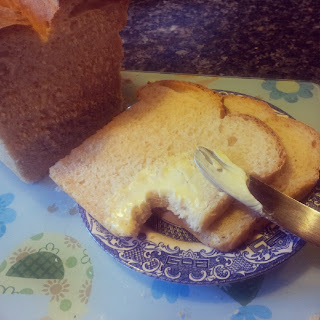 Of course, after 'Sconegate' I may well get vilified for being such an awful mother as to give up making home made bread for my child just because I selfishly want to lose weight. So I'll make sure I feed her a deep fried Mars Bar or two while we're on holiday. Just for good measure. Again, quick, pre-authored post for the day. Will update when we're back in civilisation. The recipe can be found here. Despite my detailed packing list and the fact that I ticked that I had my electronic scales, when we arrived at our first destination, I discovered they were still sat on the worktop in my kitchen about four hundred miles away. Both houses kindly provided scales, however, I probably would've been just as accurate (or not) guessing at the need for a third of a bag of flour or three-fifths of a block of butter or whatever quantity was needed because both pairs of scales looked to have come from Poundland. There's nothing wrong with Poundland (other discount stores are available). Once I'd swallowed my middle-class-aspiring-pride, I discovered some great bargains in there. But when it comes to precision baking, you need a decent set of scales. Of course, who in their right mind - other than me - would want to do precision weighing when they're supposedly on holiday? I'm so sad that I now even weigh my liquids, having worked out how much various oils and milks weigh (it differs based on the fat content). Weighing liquids is much easier when you have a measuring jug that has lots most of the numbers off of the side and are as blind as a bat and can't read the measurements anyway. So I blame my lack of appreciation of this loaf on the fact that I forgot my scales. It was a good, bog standard white bread. I'm not sure that the sour cream did much to alter the crust on the loaf when compared to Dan's standard Easy White Loaf. I was expecting a softer crust but it was actually quite firm. This could also be because I'm used to cooking in my fan oven and had a conventional oven on holiday. I guess the way to tell would be to make both loaves simultaneously (and not over six months apart!) and do a side-by-side taste test. I also did the first rise for this loaf in the fridge. I did all the faffy kneading early in the morning, then popped it in the fridge whilst we went out for the day. When I came back, I did the second rise which took about two hours and popped it into the oven and hey presto. A word to the wise if you want to try this method - reduce the yeast by half. This was a useful tip I found in Short and Sweet - I've made fridge-risen bread before and it's always tried to escape from its bowl overnight but half the yeast with this one and it was nicely contained. It kept quite well - we had it a couple of days later for fish finger sandwiches. I usually have mayo and salsa in mine but with a lack of mayo, I made up some more of Paul's Pico di Gallo and it was awesome!! The last couple of slices were fed to the local sheep. Who eat anything. I thought it was only goats that did that but they eat spaghetti, Cheerios, bananas, bird seed, polos, apples and toddler fingers. I'm in no hurry to bake this one again - it's more expensive than the easy white loaf but if I had some sour cream about to expire in the fridge, I have at least one extra way of using it up rather than forcing myself to eat nachos and sour cream. And a final post-script. Sconegate blew up in my face whilst I was away. Some people are quite happy to dish criticism out but the minute they think you've slighted them (which I didn't) they're happy to get the virtual hatchet out and head straight for your jugular. And so I've now blocked said person on Twitter. That was a sad day as Twitter is generally such a nice place to inhabit.